→Vortex StrikeFire 2 Review –The Affordable Wonder! Vortex StrikeFire 2 Review –The Affordable Wonder! It is often said that the cheapest & most affordable a product is, the more likely it will provide a low-quality experience. Well, that’s entirely inaccurate, especially when we talk about the Vortex StrikeFire II scope – an affordable & very performance-oriented device for everyone. Capable of delivering quick response and versatile experience, most users who have tried the StrikeFire II have almost nothing wrong to say about it. But yes, there are a few things this device does not do – so you will have to take a look further to find out! Here’s everything you should expect from the Vortex StrikeFire II scope! An aluminum chassis is so common that it’s almost unnecessary to mention it. However, this aluminum alloy construction at 30mm is outstanding. Not only it helps to use it a lot more easily than most scopes in the market, but it also allows users to get much better recoil while getting unlimited eye relief. What’s even better, it comes with O-rings that seal the entire scope to make waterproof, debris-free, dust-free, and moisture-free at all times. And of course, it lets no fog to get inside at any moment, thanks to the nitrogen-purged design for no internal fogging even in the harshest of environments. Saying versatility is not only saying that this scope can do it all but also saying that it is one of the fastest and most comfortable to use as well. The StrikeFire II is so comfortable& convenient that using it on any gun, especially semi-automatic and automatic ones, is just a piece of cake thanks to its Cantilever mount. No matter how experienced you are, the Red Dot and parallax-free design make it amazing to shoot with. But what stands out when it comes to versatility, is the ability to make adjustments on practically everything, from dot intensity up to night vision and even power/distance without problems at all. And of course, it comes with ten-level brightness ability so you can get even more from it. The battery-powered red-dot aim the StrikeFire II provides is almost unbeatable when it comes to convenience. You will be able to change its color, its intensity, its illumination, and at the same time will get the ability to return to your previous configuration after reinitiating it. What’s better, the device offers up to 6,000 hours of use with the same battery – so you can shoot for years before having to change its battery. And of course, it shuts down automatically so you don’t have to do it and waste your time looking for its switch. Every scope needs to come with brightness adjustments, not only to help the user see through it in different environments but also to help the shooter have a much better vision in different scenarios according to the goal& target. But the StrikeFire 2 doesn’t only offer that, it comes with ten brightness levels, and two of them are for night vision. So you won’t merely get fine brightness adjustment but a surprising ability that will become outstandingly convenient in dark places. And what’s better, it is effortless& comfortable to change them by tapping Up or Down buttons. In addition, you also get windage and elevation controls, not only to help the user get even more precise but also to improve sight and comfort. Having the chance to change both elevation and windage, changing the red-dot illumination, and configuring the brightness according to your liking may not be enough to provide a precise sight for shooting. Yes, the settings are fantastic. The overall construction is excellent, and the design is comfortable & convenient. The scope is not the most precise. It will not make you waste your shots or miss easy ones – but very likely won’t help you if what you’re looking is for 100% precise shooting scoping for big rifles. But if you use it semi-automatic to automatic guns with less recoil and precision, you will undoubtedly make better use of it. Despite having excellent features, a wide array of advantages and even being one of the smallest and cheapest – the Viper StrikeFire 2 may feel too heavy for most guns. Primarily if you use it in sub-machine guns with a lighter weight, you will immediately feel the difference when using the scope and when you don’t. This not only affects your precision and accuracy, but it also makes it a little uncomfortable to use in most cases. Most users who have used the device have complied with this disadvantage, and it seems like it is all the fault of a slightly over-ambitious construction at a reasonable level. It translates into more weight and discomfort in search of better features and performance. However, it’s not the heaviest scope for its size, and it will certainly not harm your experience exponentially. Is the Affordable Vortex Strike Fire 2 Worthy? Saying whether this scope is worthy can be complicated. But it all comes down to knowing more about it. It’s merely a little sturdier than expected for its price, and a lot more versatile despite being affordable. So, will it be worth for your needs? It all depends. If you are looking for a performance-oriented and very versatile scope for your semi-automatic rifle or sub-machine gun – you will find the StrikeFire II an outstanding option. However, if you want a light, comfortable, and utterly efficient choice – then very likely it will not meet your expectations. Consider each pro and con, and you will find out whether it works for you or not. But as an overall – it’s more than decent & worthy of your money! Vortex Strike Eagle Review – The Four-Model Scope for Everyone! Vortex Sparc AR Review – A Small Scope for the Practical Shooter! Vortex Crossfire 2 Review–Reliable & Quality at Multiple Ranges! Vortex Sparc 2 Red Dot Review–Quality & Versatility First! 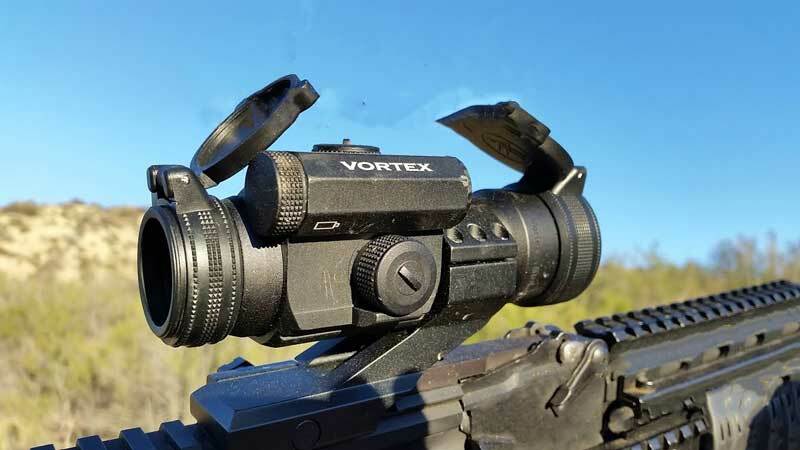 Vortex AMG UH 1 Review – A Holographic Wonder! 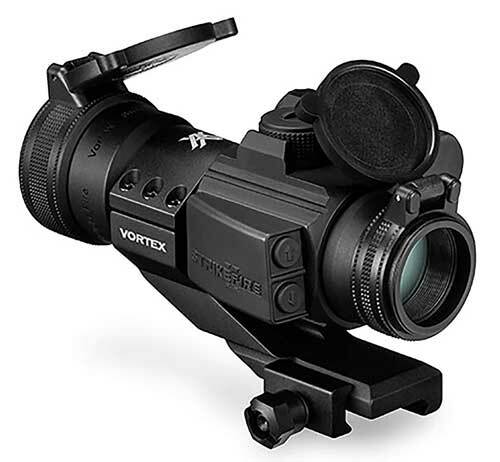 Vortex Viper PST 1-4×24 Review – A Rifle scope Not to Overlook!